RIMT University Recruitment 2018 News: Check RIMT University recruitment 2018 online in coming days, till you can see old circulars. As Regional Institute of Mgt. & Tech. (RIMT), Mandi Gobindgarh requires Assistant Professors in university for academics 2018 session. The broadcast advertisement of rimt university is given at rimt.ac.in. Interested and eligible applicants have to apply on or before 11 July 2018. 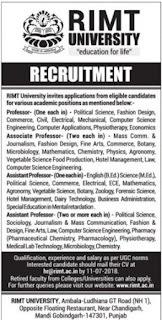 Further needed information of RIMT University Recruitment 2018 regarding application form, qualification, salary, experience and process etc is mentioned below………..
Professor- (one each in) - Political Science, Fashion Design, Commerce, Civil, Electrical, Mechanical, Computer Science Engineering, Computer Applications. Associate Professor- (two each in)- Mass Comm. & Journalism, Fashion Design, Fine Arts, Commerce, Botany, Microbiology, Mathematics, Chemistry, Physics, Agronomy, Vegetable Science Food Production, Hotel Management, Law, Computer Science Engineering. Assistant Professor- (one each in) - English (B.Ed.) Science (M.Ed. ), Political Science, Commerce, Electrical, ECE, Mathematics, Agronomy, Vegetable Science, Botany, Zoology, Forensic Science, Hotel Management, Dairy Technology, Business Administration. Assistant Professor- (two or more each in) – Political Science, Sociology, Journalism & Mass Communication, Fashion & Design, Fine Arts, Law, Computer Science Engineering, Pharmacy (Pharmaceutical Chemistry, Pharmacology), Physiotherapy, Paramedical Sciences, Microbiology, Chemistry. RIMT Recruitment 2017 News: Check RIMT recruitment 2017 online in coming days, till you can see old circulars. As Regional Institute of Mgt. & Tech. 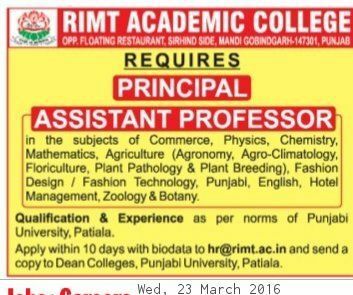 (RIMT), Mandi Gobindgarh requires Assistant Professors, Principal in college of academics 2016 - 2017 session. The broadcast advertisement is given at rimt.ac.in. Interested and eligible applicants have to apply on or before 02 April 2016 (now over......). Further needed information of RIMT Recruitment 2017 regarding application form, qualification, salary, experience and process etc is mentioned below……….. 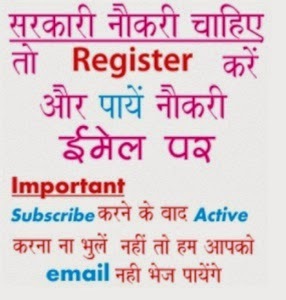 The eligible and interested candidates have to apply online by E-mail……….. Regional Institute of Mgt. & Tech. (RIMT), Mandi Gobindgarh requires Professors, Principal, Associate Professors and Assistant Professors in college of academics architecture 2015 session. The recruitment notice is published at rimt.ac.in. Interested and eligible applicants have to apply on or before 08 October 2015. More information of RIMT Recruitment 2015 regarding qualification, salary, experience and application process etc is mentioned below……….. Regional Institute of Mgt. & Tech. (RIMT), Mandi Gobindgarh requires Assistant Professors in college of academics for 2015 session. Interested and eligible applicants have to apply on or before 26 April 2015……………………..
Pay Scale- As per laid down by the UGC/ State Govt./ Punjabi University. As per laid down by the UGC/ State Govt./ Punjabi University.